A living will is instructions given by individuals specifying what actions should be taken for their health in the event that they are no longer able to make decisions due to illness or incapacity, and appoints a person to make such decisions on their behalf. 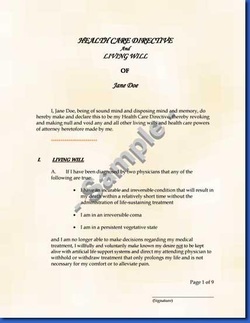 A living will is one form of advance directive, leaving instructions for treatment. Another form authorizes a specific type of power of attorney or health care proxy, where someone is appointed by the individual to make decisions on their behalf when they are incapacitated. People may also have a combination of both. Give instructions about your own health care. Part I of the advance directive form lets you give specific instructions about health care decisions. Choices are provided for you to express your wishes regarding the provision, withholding, or withdrawal of treatment to keep you alive if you have a terminal medical condition or if you become permanently unconscious, including the provision, withholding, or withdrawl of artificial nutrition, hydration, cardiopulmonary resuscitation, and mechanical resuscitation. Medically appropriate care necessary to ensure pain relief will be provided. Space is also available for you to include any additional health care instructions. Name an agent to make health care decisions for you if you become incapable of making your own decisions. Part II of the form allows you name another individual as an agent to make health care decisions for you if you can no longer make your own decisions. You may also name an alternate agent. This section of the form is called a Power of Attorney for Health Care. For more details, see What is a power of attorney for health care? Express an intention to donate bodily organs and/or tissue following your death. Part III of the form is optional. It allows you, if you wish, to designate anatomical gifts to take effect upon your death.